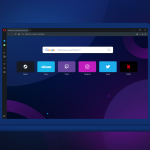 Opera is now the only major browser that continues to provide security updates for its Windows XP and Windows Vista version. Today, the first security update for this version is being released to provide millions of users worldwide with secure browsing. In April, we reported that Google and Mozilla would no longer support Windows XP and Windows Vista. This means that Firefox and Chrome users on either of these platforms are no longer receiving bug fixes or security updates. Opera remains the only major browser that takes care of these users. According to Netmarketshare’s figures, 10.34% of all computer users use Windows XP, a number that hasn’t discernibly changed since April. This means that 10% of all desktop users are very loyal to their platform – but they also need to take action to make sure they’re using a secure browser. Some of you may know that the last Opera version compatible with Windows XP and Vista was Opera 36, which is based on Chrome version 49. We promised we would continue to issue security updates and crash fixes to the Opera 36 branch, and this is our first such update with backports of fixes for some security issues that were fixed in Opera 37, based on Chrome 50. We hope these fixes will help to keep the browser a tiny bit more secure and stable. Opera 36 users will receive the update automatically; it is also available on opera.com for them. However, we still urge those users of Windows XP and Vista to switch to an OS that is actively supported so they can enjoy the latest browser versions with more features and better security. If you still use another browser on these platforms we encourage you to switch to Opera. Migrating to Opera from another browser is really easy. When you run it for the first time, you’ll be prompted to automatically import your bookmarks and other settings.